“In a world of computers and iPhones, it’s rare that we’re fully focused,” said Alan Castel, a UCLA professor of psychology. But how much do all of those distractions diminish our ability to remember? 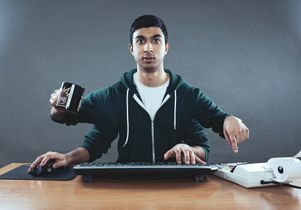 A new study led by Castel and Catherine Middlebrooks, a UCLA graduate student, found that while divided attention does impair memory, people can still selectively focus on what is most important — even while they’re multitasking. In one experiment, the researchers showed 192 students 120 words, divided into six groups of 20 words each. Each word was visible on a computer screen for three seconds, and each was paired with a number from 1 to 10. Researchers explained to the students that they would receive scores based on the point value of each word they remembered, making the words with high point values “more important” than the others. After each set of 20 words, participants were asked to type as many of the words as they could remember. The researchers calculated a total score for each student after each set of 20 words based on the number on the screen when each word appeared. So, if they remembered the word “twig,” which appeared on screen at the same time as a 10, and “corner,” which appeared with a 6, the participant would receive 16 points. The researchers then repeated the process for each student five times, taking them through all 120 words. Again, one group of students viewed the words without any disruptions. But for the other three groups, the researchers played a series of tones: one group was told to identify whether each tone was the same as the previous one, another was told to indicate whether two tones played one after the other were the same pitch or not, and the final group was told to identify each sound as high-pitched or low-pitched. As in the first experiment, students who weren’t distracted remembered an average of eight words from each set of 20. Those who were distracted by the other tasks remembered an average of about five out of every 20 — and the information they forgot tended to be the “less important” words. Participants in all four groups were again nearly five times more likely to recall a 10-point word than a one-point word. The researchers also found that students’ ability to remember information improved as the experiments progressed: In both studies, students in all four groups generally remembered more words by the sixth round of 20 words than they did in the first set. Middlebrooks recommends that people who are studying or learning new information avoid distractions as much as possible. The research, which is published in the August issue of Psychological Science, was funded by the National Institute on Aging. Tyson Kerr, a former UCLA undergraduate student, is a co-author of the paper.